Last season, Scorpion introduced the Snell-rated EXO-R410 full face helmet. With its EverClear No Fog Faceshield, Kwikwick 2 Anti-microbial Fabric Liner, and Emergency Release System, it quickly became a go-to option for a great affordable helmet. For 2015, Scorpion continues to push the creative bounds with two new graphic options. First up is the Scorpion EXO-R410 Dr. 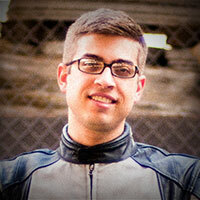 Sin Helmet. If Scorpion were a metal band, they’d be Dr. Sin. Oh wait, the Scorpions were a metal band, and actually, so were Dr. Sin. Anyway, this new helmet graphic will have metalheads everywhere throwin’ up horns. The black base is set off by a bunch of skulls glowing bright orange as if illuminated by fire...or a radioactive glow. What are those vials of green stuff anyway? If the skulls aren’t enough, there’s a spine going down the center too. If the headbangers actually bang their head, this lid will keep ‘em safe! 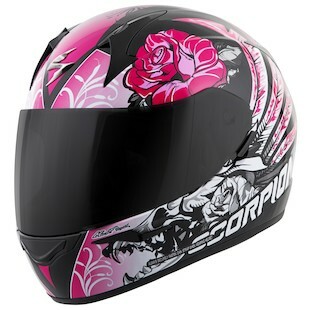 For the ladies (or the more confident male), Scorpion brings us the Scorpion EXO-R410 Novel Helmet. At first glance, the flowers and filigree may have you thinking Jane Austen, but this ain’t no Pride and Prejudice. Step aside Mr. Darcy, this novel’s a bit more grim. Jutting out along the chinbar are some pretty creepy animal skulls. 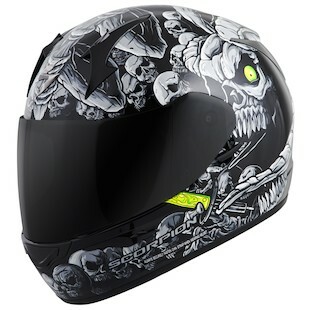 Set against those pink roses, this helmet has Beauty and the Beast written all over it. Watch out Gaston, ‘cause when midnight comes around, Belle’s coming through, riding 12 o’clock on a ‘Busa. So if you’re into skulls and only have two bones or less to spend, consider the Dr. Sin and Novel helmets.